Something as small and simple as a blanket, bringing comfort to seriously ill children. 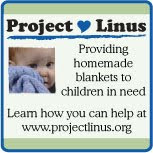 I first came in contact with Project Linus due to a close friend and her daughter's heart problems at birth. 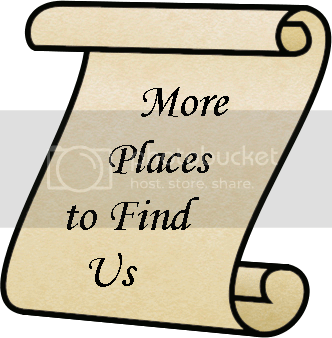 She had TOTAL ANAMOLUS PULMONARY VEINUS RETURN or TAPVR. A rare heart defect. She had 2 veins curved back into the same heart chamber. At the Children's Hospital in Oakland, doctors (including one brought in from Stanford) had to remove the problem veins, and a create pathway for the blood to flow properly to the other chambers. They just closed off the bad chamber, and she now has a unique 3 chambered heart. She also had a problem with a valve they were able to repair, but compared to the TAPVR this secondary problem was very minor. Volunteers crocheted her a hat and brought her stuffed animals. She is now healthy and happy and growing like any other girl her age, and I know the kindness and gifts from people they didn't even know, were a welcome blessing to the family during such a scary time. In addition my mom will be donating this 'Baby Spies' crib quilt that she made especially for her local Project Linus chapter (along with any other blankets she finishes or collects from family, friends, and neighbors!). 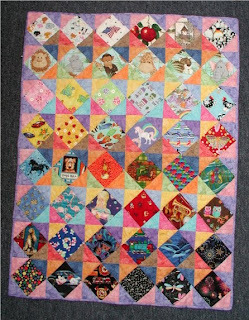 The quilt was designed with bright colors and fanciful novelty fabrics with pictures of things a very young child would find fun...like trains, candy, mermaids, dogs, cats, zoo animals, dragons, dinosaurs...and so much more. All done in 100% cotton fabrics for lasting durability and with Warm and Safe batting which is Eco-Friendly, Naturally Fire Retardant, Non Toxic, Non Allergenic and Chemical Free. Everything you need to make your own 'Baby Spies' quilt, except a sewing machine and time...hopefully you already have those. The kit will include 48 pre-cut squares of 100% cotton novelty fabrics (the same ones used in the pictured quilt above, 192 pre-cut triangles from 100% cotton Pizazz fabric (the same colors used in the pictured quilt above), binding, backing, Warm and Safe Crib Batting, a spool of white thread, and instructions with pictures. Finished crib quilt will measure approximately 36" X 48". U.C. Davis Hospital where Skyler was airlifted via helicopter due to a near drowning and was given a flannel blanket with rubber ducks, and last (hopefully!!!) to Kootenai General Hospital where Skyler was taken by ambulance to have stitches put in two very deep cuts after falling and landing on glass and where he was given a fleece blanket with crocheted edging. Skyler and Sonny just turned 5 and Sonny thinks it is unfair that Skyler keeps getting to go to the hospital in ambulances and helicopters and gets teddy bears and blankets and he has never been to the doctor except for checkups and shots where all they give you is stickers and sometimes a sucker. Thank you to all the wonderful doctors and nurses out there who give so much of themselves each and every day, and thank you to all the volunteers who lend their time and their hearts to make others feel comforted. Easy to win, do the Mandatory Entry, and any of the Additional Entries you like, add a separate comment for each. If your email is not in your Blogger profile, be sure to leave it on each entry comment. ~ Visit us on eBay and find a fabric that would look great in a baby quilt. This drawing ends at midnight on September 30th (MST, -7:00 GMT). Winner will be chosen from all eligible entries using random.org on October 1st. Winner will be notified via email and will have 3 business days to claim prize (by providing shipping information) or a new winner will be selected from the remaining entries. The Patriotic Sunbonnet Sue Redwork Machine Embroidered Quilt Blocks ar so cute! I like the Christmas Stocking Purple Plush Faux Fur Personalized Embroidery. I think the Bear Flower Butterfly Fabric would be cute on a baby quilt. I like the santa and holly baby christmas stocking. I like the purple white polka dot fabric on ebay for a baby quilt! I like the Love My Dog Christmas stocking. I really like the "turn yout t-shirt into a quilt" These are so cool! I like the blue silver filigree Christmas stocking the best. I like the Large Embroidered Awareness Ribbon Tree Tote, especially since it's available in any color. I really like the Any Color Awareness Ribbon FreeStanding Lace FSL Embroidered Earrings! I especially like the Personalized White and Black Zebra Faux Fur Christmas Stocking. I like the Bear Flower Butterfly Fabric. Thanks for this great giveaway! Congratulations to the winner of this contest. Monkey Momma! the 3 major different sub prime lenders. Villa and Rovers boss Steve Kean hopes to include him to his promotion-chasing Championship squad bad credit loans and he did not feel a threat as they just happened to be walking around the street.